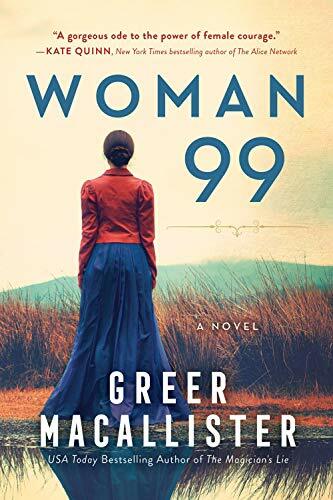 Woman 99 is a love story, wrapped in a mystery, encased in a historical novel. Greer Macallister sets her story in the late 1800s, but there are parallels to our current political climate. Society controls and silences inconvenient women, but the women also fight back, forging new identities in the midst of that suppression. Convinced she can save her sister, Charlotte goes undercover. Faking a fit of madness in a public space, she has herself committed as a means to get inside. That scenario alone would be a fascinating journey, brought to life as it is with Macallister’s careful research into the bizarre and often cruel treatment of “patients” in the early age of mental health facilities. But the plot of freeing Phoebe is inextricably linked with Charlotte’s arranged marriage. Macallister’s exploration of both the public and the personal takes this novel to a higher level. Macallister carefully weaves the revelations of Charlotte’s personal life into the unfolding experiences at the asylum. She drops hints of Charlotte’s past along the way, leaving the reader to follow the breadcrumbs through the forest. Another powerful force of the novel is Macallister’s ability to show the complications of dealing with mental health issues. While the treatments at Goldengrove are often horrifying, there is also the very real question of what to do with a person who cannot safely live in society. The balance between the rights of an individual versus the safety of society is a tricky one. With a nascent understanding of psychological disorders, even well-meaning caregivers made terrible choices. While Phoebe herself may need psychological help, many of the women locked up at Goldengrove are simply inconvenient. The unwanted wife, the upstart daughter, the female property owner—women were sent to asylums by parents and husbands and judges. “Once Nora confirmed for me that insanity had very little to do with why women ended up in Goldengrove, it all came clear.” Wealth does not protect these women, nor does anger or logic, it is only when they band together that they are able to make their captivity known and find their way to freedom. Macallister’s voice leans toward the literary. Whether describing the asylum or Charlotte’s life before it, she paints pictures with words, as with her description of Charlotte’s banishment to isolation after an infraction. The heightened language slows the pace of the novel, though that doesn’t mean it lacks tension. Macallister finds the sinister in both the asylum and Charlotte’s life outside. Danger exists in her captivity, but also in the demands her parents make, based on their own financial and social positions. As with the best historical novels, Woman 99 resonates with our current social upheavals. It illuminates how far we, as a society, have come and how far we have yet to go. Charlotte Smith has much to learn about the lengths people, even ones she trusts, will go to protect their place in the world. And in Macallister’s capable hands, so do we.